« “Forgotten Hollywood”- Summer Book Tour Begins in August! Tony Martin was a contemporary of Bing Crosby and Frank Sinatra, and he appeared in dozens of motion pictures during Hollywood’s studio era. 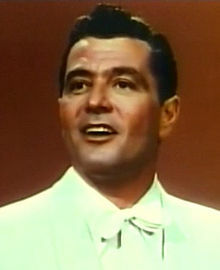 He also wed Alice Faye, and the crooner had a lasting partnership with Cyd Charisse. Martin was also popular during radio’s heyday. For a number of years, Tony Martin recorded with Decca Records, and he had hits such as South of the Border, Fools Rush In, Begin the Beguine, and To Each His Own. After leaving the label, he signed with Mercury Records, and later, with RCA Victor. His songs continued to sell, including his versions of It’s Magic, La Vie en Rose, I Apologize, and Stranger in Paradise. During World War II, he was assigned to Capt. Glenn Miller’s band as a corporal in the United States Air Force. He was a featured vocalist on the George Burns and Gracie Allen radio program. The Tony Martin Show, a 15-minute television variety program, aired on NBC from 1954 to 1956 prior to the evening newscast. The tall baritone worked with Judy Garland, The Ritz Brothers, Eddie Cantor, James Stewart, Lana Turner, Barbara Stanwyck, Joel McCrea, and Esther Williams. His long marriage to Cyd Charisse lasted sixty years, until her death in 2008. Tony was into his 90s when he retired from nightclub performances. This entry was posted on Monday, July 30th, 2012 at 12:28 pm	and is filed under Blog by Manny Pacheco. You can follow any comments to this post through the RSS 2.0 feed. Responses are currently closed, but you can trackback from your own site.